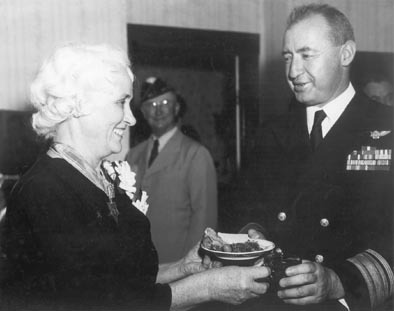 Laura Francis Lummus serves refreshments to Admiral Clark during the reception in her home following the Memorial Day Service. In the background is Lt. Colonel Isaac G. Moore, Commander, Sixth District, American Legion, Department of Texas. Laura displays a double frame containing pictures of her son's fiancée Ethlyn "Skipper" Bookwalter and Jack. 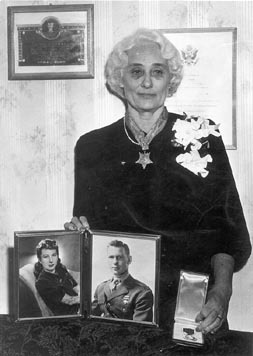 In her left hand the satin-lined box contains the Purple Heart posthumously awarded to Jack on June 7, 1945. Rear Admiral Clark wrote a "thank you" letter to Laura Lummus on June 5, 1946. © 1999-2006 Utility Press Inc. All rights reserved. Copyright claim exclusive of photographs.